I wrote a very detailed post about five different ways to get a book published, but never got around to telling you how I'm planning to get my book published. I learned I'd need a query letter and that I'd need to research agencies to query. This query letter would be sent to literary agents requesting representation for my manuscript. They either want just the query letter or the query letter plus the first one to three chapters, or the query letter plus the first ten pages. Some may also want a synopsis so I had to be prepared for that also. Each query letter has to be tailored according to specific agency submission guidelines, and the idea is that you keep sending queries until someone requests the full manuscript. It's also important not to burn through all submission options in one go. Test the waters and await possible feedback, or lack thereof. Depending on that, I would need to consider tweaking the query letter or halting submissions altogether to revise my manuscript. 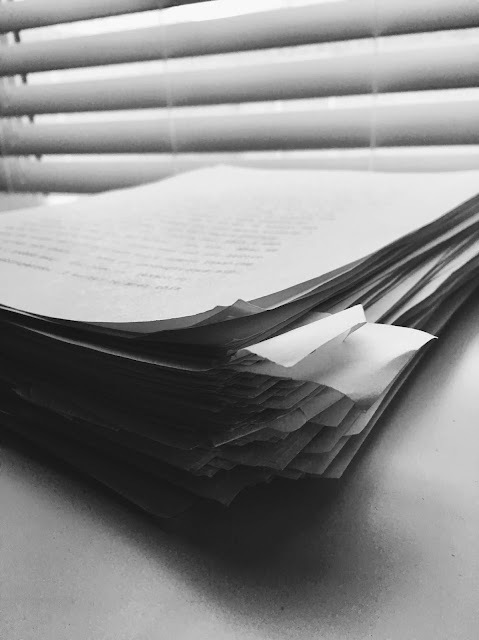 It can take a really long time to hear back from an agent at each step, and some of them have rules about whether or not they allow submission of the full manuscript to any other agents while they are reviewing it. So you can imagine how long this could take, and how delicate the process. If I got an agent, there could be more revisions. Then, said agent would try to sell my book to a publisher. If it sold there could be additional revisions after that. If I was lucky. I still wasn't sure about how I felt about any of this, but there was only one way to find out. I did the query letter, researched agencies, and wrote a synopsis. I didn't expect that summarizing my entire novel in a few paragraphs would be almost as difficult as writing the book in the first place, but it was and I had to put a lot of work into preparing submission materials. Hitting send on the first query letter submission was really hard. I could still revel in the joy of having written a novel and all the wonderful possibilities it might entail, but once I hit submit all of that would most likely change. Any day, I could be told my manuscript wasn't good enough. I didn't want to face rejection, but it's part of the process and had to be done. Although there are only five large publishing houses, hence the term, Big Five, they also have a slew of imprints. This handy dandy chart shows them. Outside of Big Five, is a plethora of independent small press publishers. Big Five is well...Big Five. It's hard to get in, so I researched independent publishing options, specifically ones that don't require an agent, because it would be one less hoop to jump through. I was super overwhelmed with the sheer prospect of finding one that might be interested in my book at all. Most of the small presses I found have a narrow focus. Some of them wanted things like stories set in third world countries, historical fiction set in a certain state, or stories of a marginalized female protagonist. My novel is a fairly commercial Women's Fiction/Literary Fiction. They called for either very high brow literary works or else something very specific I didn't have to offer. I did consider submitting to a hybrid that charges $6,000 for publication. I think they charge that much because they want to do it right. I like that idea. Doing it right, but I didn't want to pay that much money if I didn't have to. In the end I queried six agents. Five agents said no, and one never replied. After that, I queried two publishers that accepted non agent submissions. One publisher said no, but the other one said yes. I ceased all submissions after that. So here's the thing. I like the idea of traditional publishing. It would have been really cool to see my efforts pay off in such a concrete manner. And what author doesn't want to walk into a bookstore someday and see their book on the shelves? I mean, that is quite literally the dream right? Well, that plus a book tour, and having it made into a movie. For some people big five is the end all be all. Even small press is a failure. I'm not one of those people. I don't like the idea of giving up a percentage to an agent, and then being paid such a low royalty on top of that. I don't like the idea that so much is out of my control. An author can get dropped by an agent if the book doesn't sell, and that's it. You can't approach another agent without disclosing that it was shopped around to publishers, and many agents won't take it on after that. The publisher can back out of a contract any time they want, and even if the deal goes through they can pull a book out of circulation at will. I suppose you can always get your rights back and self publish after that, but in both cases you'd have to start from scratch with another book if traditional publishing is still what you want. Publishing books traditionally and getting them into bookstores is expensive, and it's all about making money and getting that return on investment. It's a business. I get it, but I don't like the decisions, and potential fallout a money making machine like that generates. I don't like it that they say no to so many manuscripts for reasons that have nothing to do with how good the manuscript actually is. Sure. You could be one of the lucky ones who sells their book quickly, or snags a huge advance, but the reality is that the odds are against you, and most authors, big five or otherwise, still don't make enough money to support themselves on writing alone. I think it would have been nice to be accepted by the big guns, but it turns out that kind of validation isn't so terribly important to me. By the time I finished finished my novel (for the fourth time! ), all I wanted to do was get it out there. That was always the goal, provided I felt good about what I'd done in the end. Write a good book and get it out there. That's it. When my publisher said yes, I didn't have to think too hard about what I would do. It felt great that someone believed in my book enough to say yes, without asking for anything in return. I could spend whoever knows how much longer pursuing traditional publishing, or I could sign the contract and get my book out there now. If I hadn't gotten a yes from a publisher I felt comfortable with, I think I would have continue to pursue agents for a while longer. I probably also would have submitted to the expensive hybrid...just to see. One thing I would not do, however is settle for the answer no. Nobody gets to decide whether or not my book gets published but me. Maybe twenty years ago, but not today. I was a bit nervous about self-publishing by myself, but I would have also considered a self publishing company. I have no idea which one, because there are a lot of bad apples out there. Many authors will shelve their book if it doesn't sell traditionally, but I don't know if I could do that. Most days, when I'm not having a crisis of confidence as most writers do, I'm really proud of my novel. Also, I spent a pretty freaking long time writing the damn thing. I don't think I could bear to have it sit in a drawer and never see the light of day. Maybe if I were still in my twenties. Maybe if I'd only spent a year or two writing and revising my book. Maybe I would have had a few years patience left within me to use towards pursuing an agent, and big five publication, but that was not my situation or my ultimate goal. My publisher probably describes themselves as a hybrid, however if you want to get technical I think it falls somewhere between small press and hybrid because they do not require any money up front and maintain high standards for acceptance and publication. The business model is fair to authors and everyone involved, and I really love that. They haven't published a ton of books in my particular genre, but the books they do publish are well edited and professional. Will everyone like my book? Will anyone buy it? Will I make any money? I don't know the answer to any of those questions, and neither does my publisher, which is actually a good sign because nobody on the planet can guarantee book sales. Any up front promise of success is a lie. There are no guarantees, but I feel like I found a good home for my book and I'm really excited about the journey ahead. I have been following this intensely because I'm now in the process of writing my second book. My first was the ebook but it gave me the courage I needed to keep going. I'm so glad you got a yes without having an agent; I was under the impression that one always needs an agent. If you don't mind can you share the publisher? Congratulations on this labor of love. Very exciting stuff. Congratulations on finding a path that worked for you! This is seriously so very exciting! So very proud of you. Looking forward to reading it!